Rakesh Jhunjhunwala is a multi-billionaire, celebrity stock market investor and partner in his asset management firm, Rare Enterprises. He is a known face on TV and business newspapers, as he is considered to be an ace stock-picker. He is called India’s Warren Buffet for his focus on long-term investments. 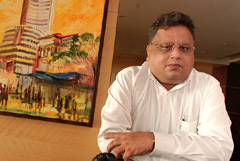 Rakesh Jhunjhunwala has had a spectacular year 2012 as the Indian stock markets give returns of 25% and his portfolio also bring magnificent returns. Rakesh Jhunjhunwala has love with three stocks from 3 different sectors. . These three core stocks forming 55% of his portfolio are “Titan Industries”, “CRISIL” and “Lupin”. His largest holding Titan Industries went up around 50% in 2012. Second largest holding CRISIL has given 12% return in 2012; While LUPIN has given 33% returns. Making profit of 800 Cr in Titan, 60 Cr in CRISIL and 128 Cr in Lupin, portfolio grow by 1000 Cr only by these three core holding. It is always said to be good strategy to book profit in stock which is performing well. Keeping this theory in mind Rakesh Jhunjhunwala has booked profits in four stocks in 2012. These stocks are Great Eastern, Bharat Electronics, Bharat Earth Movers, Praj Industeries. Rakesh Jhunjhunwala said He has booked very good money on these stocks. In 2012 apart from making profit Rakesh Jhnunjhunwala has picks some stocks and added in his portfolio. He has picked Spicejet and purchased 25 Lakh shares in 2012. Apart from spicejet his bet was on DB realty where he purchased 12.5 lakh shares. He has also purchased 5 lakh shares of Compucom in 2012. Jhunjhunwala sees Titan Industries as good stock and it may deliver a growth of 18-20 per cent p.a. Titan Industries has given a year-to-date return of nearly 50 per cent. He also thinks that Titan Industries should be included in the Nifty 50 stocks as there are no retailing stocks in the index and Titan is a retailer with the highest market cap. Another pick by him is Lupin, Lupin gained over 35 per cent compared to a 25 per cent rise in the benchmark index Sensex. As per Jhnunjhunwala this stock is expected to deliver return on 18 % in coming year. Rakesh jhunjhunwala partial portfolio is worth Rs. 5119 crores as of 11th January 2013. Major stock holding is in Titan Industries, CRISIL & LUPIN. If you find this interesting do share it with friends and colleagues, and yes don’t forget to add your comments!